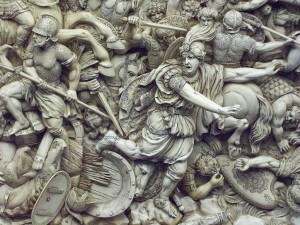 The Battle of Gaugamela was the decisive battle of Alexander the Great‘s invasion of the Persian Achaemenid Empire. In 331 BC Alexander’s army of the Hellenic League met the Persian army of Darius III near Gaugamela, close to the modern city of Dohuk (Iraqi Kurdistan). Though heavily outnumbered, Alexander emerged victorious due to his army’s superior tactics and his deft employment of light infantry. 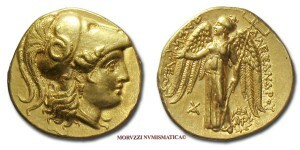 It was a decisive victory for the Hellenic League and led to the fall of the Achaemenid Empire. After the failure of the second negotiation attempt, Darius started to prepare for another battle. Even so, he made a third and final effort to negotiate after Alexander’s departure from Egypt. Darius’ third offer was much more generous. 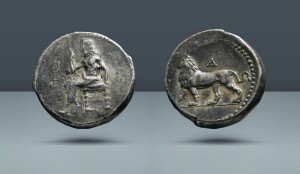 He praised Alexander for the treatment of his mother Sisygambis and offered him all territory west of the Euphrates, co-rulership of the Achaemenid Empire, the hand of one of his daughters and 30,000 talents of silver. In the account of Diodorus, Alexander deliberated this offer with his friends. Parmenion was the only one who spoke up, saying, “If I were Alexander, I should accept what was offered and make a treaty.” Alexander reportedly replied, “So should I, if I were Parmenion.” Alexander again refused the offer of Darius, insisting that there could be only one king of Asia. He called on Darius to surrender to him or to meet him in battle to decide who was to be the sole king of Asia. With the failure of diplomacy, Darius decided to prepare for another battle with Alexander. While Darius had a significant advantage in numbers, most of his troops were of a lower quality than Alexander’s. Alexander’s pezhetairoi were armed with a six-metre pike, the sarissa. The main Persian infantry was poorly trained and equipped in comparison to Alexander’s pezhetairoi and hoplites. The only respectable infantry Darius had were his 2,000 Greek hoplites and his personal bodyguard, the 10,000 Immortals. The Greek mercenaries fought in a phalanx, armed not with a heavy shield but with spears no longer than three metres, while the spears of the Immortals were two metres long. Among the other Persian troops, the most heavily armed were the Armenians, who were armed the Greek way and probably fought as a phalanx. The rest of Darius’ contingents were much more lightly armed; the main weapon of the Achaemenid army historically was the bow and arrow, and javelin. The Scythian cavalry from the Persian left wing opened the battle by attempting to flank Alexander’s extreme right. What followed was a long and fierce cavalry battle between the Persian left and the Macedonian right, in which the latter, being greatly outnumbered, was often hard-pressed. However, by careful use of reserves and disciplined charges, the Greek troops were able to contain their Persian counterparts, which would be vital for the success of Alexander’s decisive attack. The tide finally turned in the Greek favor after the attack of Aretes‘ Prodromoi, likely their last reserve in this sector of the battlefield. By then, however, the battle had been decided in the center by Alexander himself. As the Persians advanced farther and farther to the Greek flanks in their attack, Alexander slowly filtered in his rear guard. He disengaged his Companions and prepared for the decisive attack. Behind them were the guard’s brigade along with any phalanx battalions he could withdraw from the battle. He formed his units into a giant wedge, with him leading the charge. The Persian infantry at the center was still fighting the phalanxes, hindering any attempts to counter Alexander’s charge. This large wedge then smashed into the weakened Persian center, taking out Darius’ royal guard and the Greek mercenaries. Darius was in danger of being cut off, and the widely held modern view is that he now broke and ran, with the rest of his army following him. After the battle, Parmenion rounded up the Persian baggage train while Alexander and his bodyguard pursued Darius. As at Issus, substantial loot was gained, with 4,000 talents captured, the King’s personal chariot and bow and the war elephants. It was a disastrous defeat for the Persians and one of Alexander’s finest victories. Darius managed to escape with a small corps of his forces remaining intact. The Bactrian cavalry and Bessus caught up with him, as did some of the survivors of the Royal Guard and 2,000 Greek mercenaries. At this point the Persian Empire was divided into two halves—East and West. On his escape, Darius gave a speech to what remained of his army. He planned to head further east and raise another army to face Alexander, assuming that the Greeks would head towards Babylon. At the same time he dispatched letters to his eastern satraps asking them to remain loyal. The satraps, however, had other intentions. Bessus murdered Darius before fleeing eastwards. When Alexander discovered Darius murdered, he was saddened to see an enemy he respected killed in such a fashion, and gave Darius a full burial ceremony at Persepolis, the former ceremonial capital of the Persian Empire, before angrily pursuing Bessus, capturing and executing him the following year. The majority of the remaining satraps gave their loyalty to Alexander and were allowed to keep their positions. The Achaemenid Persian Empire is traditionally considered to have ended with the death of Darius.